Atlanta and the surounding areas is a beautiful place to live and Atlanta is currenlty the number three tech hub in the United States accourding to Forbes! There is something for everyone: tremendous green space, the world’s busiest airport, 5-star hotels and restaurants, a thriving arts community, and countless entertainment options. All this is set in one of the most historic places in the South. It’s no wonder so many fortune 500 companies call Atlanta home. If you are new to the city, please contact us so we can schedule a time to meet in person and show you the best Atlanta has to offer. If you decide to make it your home, The Davenport Goup has the most knowledgeable agents in the business to help you with your move. Because we have been helping clients relocate to Atlanta and the surrounding areas for over 12 years we have intimate knowledge of the communities to cater to your desiered every day life style. We are committed to creating a full service experience to make the transition of moving as smooth as possible. We strive to make the process more enjoyable by offering customized real estate and relocation solutions. Whether you are a first time home buyer or relocating for work, we have you covered! As part of our relocation services and we provide area tours at no cost so you can make a knowledgeable decision about your new place to call home. 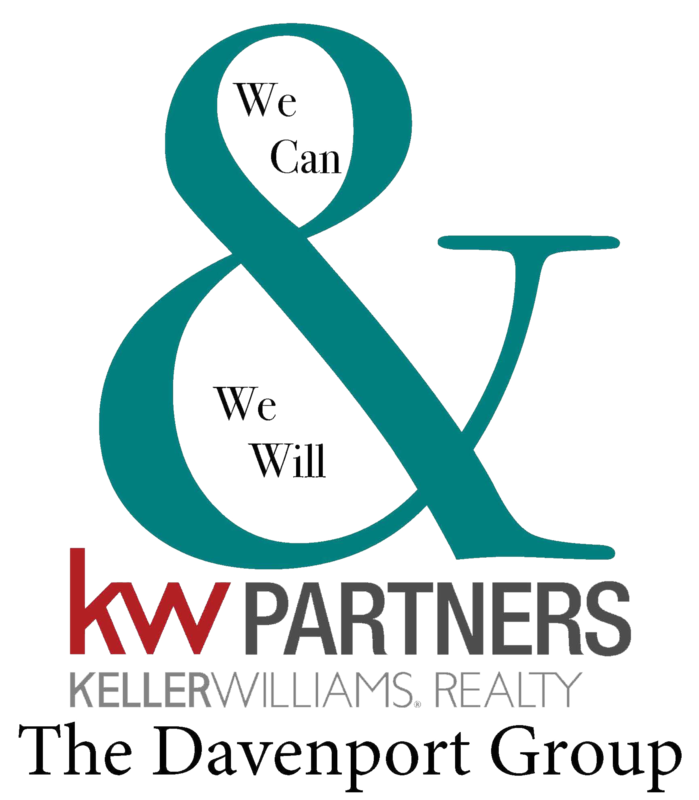 We also assist in finding a rental location if your relocation time frame does not allow for a home purchase. Here at The Davenport Group we make it our #1 priority to give you, our client, 5 star service from the beginning of your real estate journey, all the way through the closing, and beyond. Give us a call at 678-744-9027 today to get started! Below are helpful links to sites with community information for Atlanta and Georgia. In 1837, Henry Irby purchased 203 acres in what is now the center of Buckhead for $650. He opened a tavern and grocery store at the northwest corner of Roswell Road and West Paces Ferry Road that became a stopping place for travelers in the sparsely populated wilderness. Before long, the community that grew around Irby’s store became known as Irbyville. 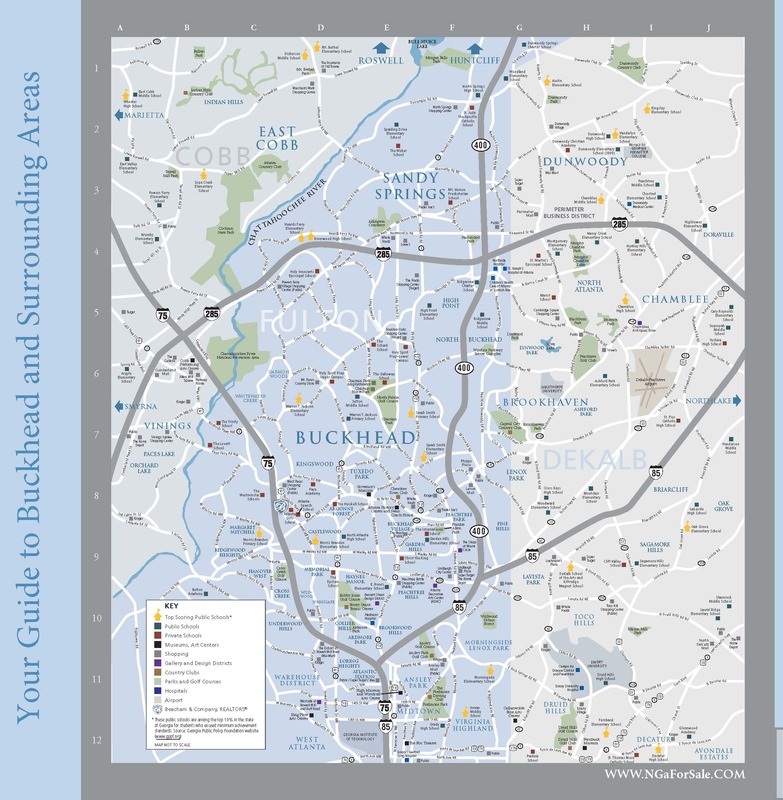 At some point in the mid-1800s, the head of a large deer was put on a post not far from the tavern, and from then on, the area became known as Buckhead.1 By the early 20th century, Buckhead had become a posh suburb of Atlanta, where many of the city’s wealthiest people resided. The area was annexed into the city of Atlanta in 1952, and as early as the 1960’s, Fortune magazine described it as “the top encampment of business executives in the Southeast,” and that remains true today.2 Sometimes called “the Beverly Hills of the East,” Buckhead is home to one-of-a-kind estates, an abundance of trees, the Southeast’s finest shopping and restaurants, and some of the nation’s best private schools. Development of Ansley Park began in 1904 when a group of businessmen led by Edwin P. Ansley purchased a large plot of land north of the city, creating Atlanta’s first northern suburb.3 Today, Ansley Park is no longer a suburb but an oasis of grand homes and green spaces set against the backdrop of modern skyscrapers in nearby Midtown. The neighborhood is revered for the architectural significance of its homes and inspired land plan, which incorporates wide parkways and majestic parks (Winn and McClatchey). Ansley Park is home to Ansley Golf Club (1912), which has been ranked among the top nine-hole courses in the United States bySports Illustratedmagazine.4 Many Ansley Park residents are also members of the nearby Piedmont Driving Club (1887), one of the most prestigious private country clubs in the Southeast. Brookhaven was developed in 1911 by the Mechanical and Manufacturers Club, who hired Long Island golf pro Herbert H. Barker to design a nine-hole course on the property. A year later, the Brookhaven Country Club opened as Atlanta’s second golf course (after East Lake in 1906). Atlanta’s Capital City Club purchased the Brookhaven Club in 1915 and expanded the golf course from nine to 18 holes. The clubhouse was finished in 1928. The clubhouse and the community are both listed on the National Register of Historic Places, and the community is a National Historic District. Many homes were designed by well-known Atlanta architects of the period including Neel Reid and Hal Hentz.5 Today, many Brookhaven residents choose to live in Brookhaven because of its country club lifestyle and proximity to Atlanta’s finest shopping, including Phipps Plaza. Druid Hills dates from 1905 and is one of Atlanta’s oldest neighborhoods. The area was designed by Frederick Law Olmstead, who also created Central Park in New York City. Olmstead planned Druid Hills with winding, tree-lined streets and small parks, the most famous being Ponce de Leon Park, a picturesque string of parks along Ponce de Leon Avenue. The neighborhood contains some of Atlanta’s most historic mansions designed by such notable architects as Walter T. Downing and Neel Reid.6 In fact, one such home was featured in the Academy Award-winning film Driving Miss Daisy (1989). The community is anchored by Emory University, Emory University Hospital, and the internationally recognized Centers for Disease Control and Prevention (CDC). Druid Hills is also home to the Fernbank Museum of National History, Fernbank Science Center and the Callanwolde Fine Arts Center. East Cobb draws families who seek a suburban lifestyle with relatively low property taxes and excellent public schools, which are among the top 10% in the state including three of the state’s top 10 highest achieving high schools. East Cobb is also renowned for its competitive youth sports leagues. The area’s upscale shopping includes The Avenue at East Cobb. Morningside was first developed in 1923 following the success of the Virginia Highland neighborhood to the south.7 Development of Virginia Highland began two decades earlier than Morningside when the Atlanta Streetway Rail Company extended a trolley line to the area from Five Points in downtown Atlanta.8 In fact, both neighborhoods were developed with the streetcar in mind. Morningside shares many similarities with Virginia Highland, including a preponderance of Tudor and bungalow style homes, small parks, and mini villages with restaurants and boutique shops. The shopping and bars in Virginia Highlands are decidedly more eclectic than Morningside, which has a popular farmer’s market and a 30-acre nature preserve. Vinings is named for an engineer who came to the area on behalf of Western & Atlantic Railroad in the 1830s to build a railroad bridge over the Chattahoochee River.9 The community is known for its charming, Victorian-inspired village with boutique shops, fine restaurants and coffee houses. Vinings residents are attracted to the area by low Cobb County property taxes, proximity to Buckhead, the private schools there and the community’s overall small town feel. 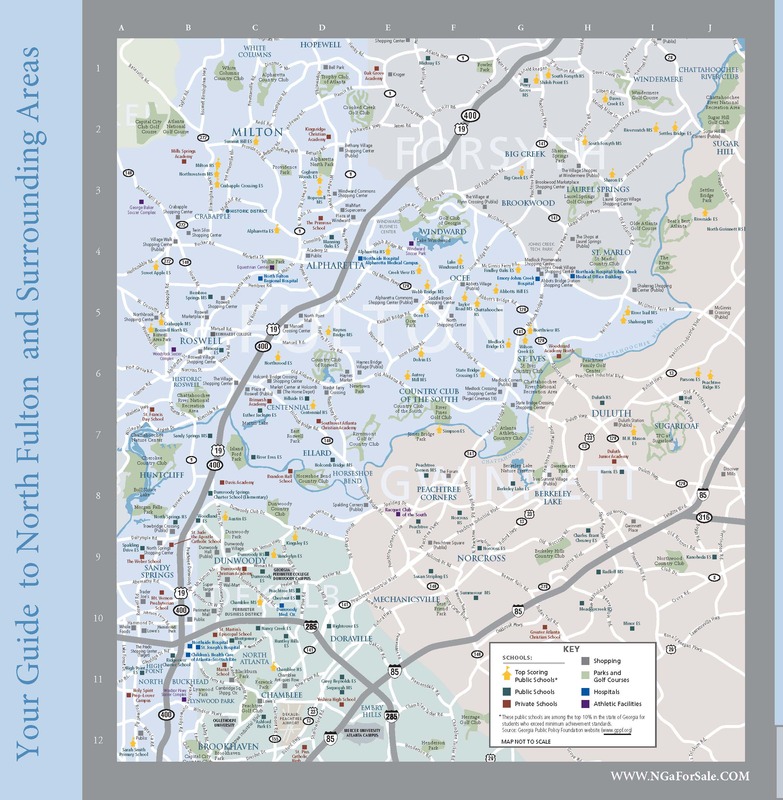 The term “North Fulton” refers to the area of Fulton County north of I-285. North Fulton was still a sleepy, mostly rural area 30 years ago but as a result of GA 400 opening in the 1970s, economic development boomed. Today, North Fulton is the prime relocation destination for many public and private companies moving headquarters and office operations to metro Atlanta. The area is home to perhaps the largest concentration of top-performing public schools in the state – 31 in all. North Fulton and neighboring Forsyth County to the north are also a golfer’s paradise, with more than two dozen public and private golf courses. Many of those golf courses are within prestigious country clubs such as St. Ives, St. Marlo, and Country of the South. The area is also home to many horse farms, with the Milton area retaining much of the county’s rural tradition. Alpharetta traces its history to the time of the resettlement of the Cherokee Indian Nation in the 1830’s. Farmers and merchants who were the fortunate winners of land lotteries developed the first permanent settlement in the area known as New Prospect Campground. In 1858 the town was chartered and became the seat of newly formed Milton County. The name Alpharetta comes from the Greek words “alpha” meaning first and “retta” meaning town. Over the next 75 years, Milton County lacked significant growth due to lack of railroad access and the onset of the Great Depression in the early 1930’s. Milton County avoided bankruptcy by merging with Fulton County, and as a result, the first county roads were paved.1 Most of the Alpharetta you see today however is the result of the development of 2,950 acres for the Windward community beginning in the early 1980s. This master-planned community of approximately 2,400 homes features a 197-acre lake, sports complexes, an acclaimed golf course and a large office component, which is home to many public and private companies. Located near upscale Perimeter Mall and the Perimeter Business District, which the Atlanta Business Chronicle recently called “the city center of Atlanta,” Dunwoody began to take off in the 1970s following the completion of I-285. The construction of the Williamsburg style Dunwoody Village was the first of several upscale shopping areas in the south part of town. Today, the community is home to Dunwoody Country Club and Golf Course and is served by two of the highest achieving elementary schools in the state, Austin Elementary and Vanderlyn Elementary. A new school, Dunwoody Elementary, opened in 2009. The town of Milton was created from an area of unincorporated Fulton County in 2006. Long renowned for horse farms and its bucolic rural countryside, the area has grown in recent years through the addition of upscale neighborhoods such as Alpharetta County Club, Trophy Club of Atlanta, and White Columns Country Club. Milton boasts excellent schools, many of them newly-constructed in just the last several years. Areas within the town of Milton include the quaint historic district of Crabapple and the villages of Birmingham and Hopewell. Like Alpharetta to the north, Roswell was home to the Cherokee Indian tribe until the 1830s. About the same time, gold was discovered in north Georgia, and the ensuing mining rush prompted a man named Roswell King of Darien, Georgia to investigate the area. Traveling on horseback, Mr. King followed Indian trails to the Chattahoochee River near what is now Roswell. The vast forests and the rushing waters of Vickery Creek inspired him to construct various mills, which were incorporated as The Roswell Manufacturing Company in 1838. Mr. King offered homesites and investment opportunities to his friends and associates from coastal Georgia, and a community was built. Mr. King’s associates constructed magnificent homes along with cottages and apartments for mill workers, a general store, a church, and an educational academy for the children. Originally chartered in 1854 and part of Cobb County, Roswell was ceded to Fulton County to facilitate the merger of Milton County into Fulton County in the 1930s.2 The mill operations remained active until 1975, when Roswell became popular as a bedroom community for Atlanta. Much of the town’s original charm remains within Historic Roswell which is home to boutique shops and upscale restaurants. Named for a spring that is still in existence today, the recently formed city of Sandy Springs (2005) is comprised of diverse neighborhoods, many with popular swim and tennis clubs. Residential development began in earnest in the 1950s, and commercial development took off in the 1970s following the completion of I-285 (1969). In recent years, architects and builders have flocked to the area to build mansions on the area’s sprawling lots. The city’s main shopping district is located along Roswell Road between I-285 and Abernathy Road. Forsyth County was created in 1832 from a partition of former Cherokee Indian lands, it was named for Virginia native John Forsyth, who was Governor of Georgia from 1827-1829 and Secretary of State under Presidents Andrew Jackson and Martin Van Buren. The county is home to Lake Sidney Lanier, a reservoir created by the completion of the Buford Dam on the Chattahoochee River in 1956. The lake is named for 19th century musician and poet Sidney Lanier, a Macon, Georgia native who penned “The Song of the Chattahoochee.” In 2008, Forsyth County was named the 13th most wealthy county in the nation by Forbes.com and the wealthiest in the state of Georgia, with much of the wealth concentrated in the southern part of the county.3 The county consistently ranks as one of the fastest growing in the country as many new residents move to such upscale communities as Chattahoochee River Club, Laurel Springs, Polo Golf and Country Club, St. Marlo Country Club, Windermere, and Vickery.